← From one extreme to the other! The imaging object of the month for October is the mass of emission nebulosity near Deneb in the constellation Cygnus: NGC7000 the North America nebula, and IC5070 the accompanying Pelican nebula, are both very large and very bright Hydrogen alpha sources emitting near 656nm in the red region of the spectrum. With M31 being considered perhaps a little early in September, it might also be considered that this pair of objects is being considered a little late, after all Cygnus is a summer constellation. However, I have it clearly written in my notes that the summer triangle [Vega, Altair, Deneb] are overhead mid-October around 8.00 p.m.
Also, imaging in the summer months of June/July/August is severely hampered by short evenings, and even when darkness falls after 11.00 p.m. the sky is still reasonably “bright” by winter standards. So it is useful to try and grab some summer objects a bit later in the year before you lose them too far in the west. The major difficulty associated with imaging this region is the same as trying to image M31 – it’s the size! 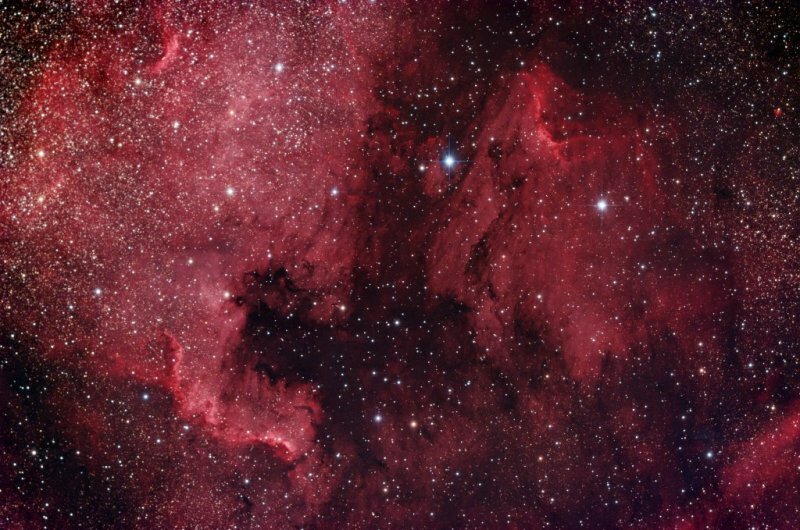 The 3.33 x 2.22 degree field of view of the Sky 90/M25C does not quite capture the whole of the North America and Pelican nebulae – a two-frame mosaic is required to do this. However, being bright sources, sub-exposure times of only 5-minutes are sufficient to capture even the fainter stuff. Being almost entirely an HII region, your images will benefit greatly from some H-alpha filtered subs, and you may want to try some OIII as well. For my Sky 90/M25C combination I would try to get around 8 hours of IDAS filtered RGB data using 5-minute subs, and 4 hours of H-alpha data using 20-30 minute subs depending on the sky glow conditions. When you come to image this region, really build up the contrast with some deep H-alpha, OIII filtered subs – I look forward to seeing your images. The accompanying image is only around 4 hours total exposure time using RGB only, and it could have easily done with at least twice that amount of exposure.